BikeBookings enables shops to take bookings online 24/7 via our app or your unique booking link which can be shared on your website, social media or newsletter. You have a clear calendar view by-mechanic that you can use to manage your workload. We have a built-in SMS solution that not only sends reminders about bookings but also allows the technicians to message your customer and receive responses on your dashboard. There is also a built-in Customer Relationship Management (CRM) styled SMS follow up solution that can follow up with your customers automatically. 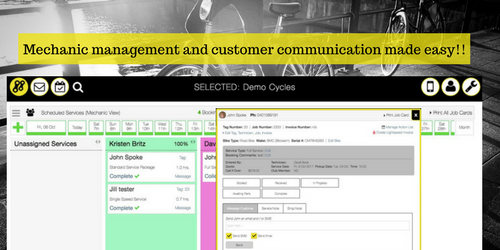 BikeBookings is a designed from scratch particularly for the bicycle industry and offer store managers visibility and efficiency benefits to their workshop and the ability to manage their technicians and communicate via SMS or E-Mail with their customers in real time. 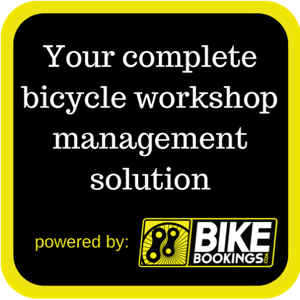 BikeBookings is one of the only complete workshop management systems that is designed solely for the Bicycle Industry. BikeBookings enables shops to take bookings online 24/7 via our app or your unique booking link which can be shared on your website, social media or newsletter. You have a clear calendar view by mechanic that you can use to manage your workload. We have a built-in SMS solution that not only sends reminders about bookings but also allows the technicians to message your customer and receive responses on your dashboard. There is also a built-in Customer Relationship Management (CRM) styled SMS follow up solution that can engage with your customers automatically. With BikeBookings you can have unlimited staff listed and list as many services as needed, you never pay more than the low monthly subscription. BikeBookings can save you on average 15 minutes per standard service which you can use to take more bookings for the same labour cost. Give your customers clear instant updates and avoid phone tagging when trying to communicate with your customers. Integrate with Lightspeed within seconds to send invoices directly from BikeBookings to Lightspeed, while we look after syncing your Staff, Customers and Service Packages. 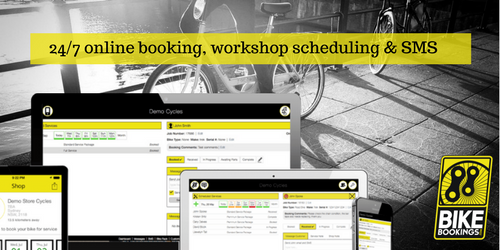 “BikeBookings is specifically designed for bicycle workshops – that’s a big plus. The thing that really sold me was how quick and responsive Kristen was in making the few changes we requested. I decided that BikeBookings would be a good partner to work with, not just now, but into the future.” Matt Turner of 99 Bikes. Developed in Perth, Australia and Monterey Bay, California. Founders Kristen & David have a keen interest in Bikes, IT and excellent business solutions, BikeBookings is a combination of this and 3 years of development and research work to offer what we feel is the most advanced solution specifically designed to assist Bike shops to manage their workshops and get significant returns. Kristen & David are always looking for ways to improve the solution and encourage feedback. We want to help the LBS success in the modern online era by using it as a tool rather than an excuse. Bikebookings offers a free 30-day trial, no contracts and no credit cards required ! BikeBookings provides an exclusive opportunity to Lightspeed customers and offers a 10% discount on all BikeBooking packages. Simply select the promotional code for your region when signing up for BikeBookings here.